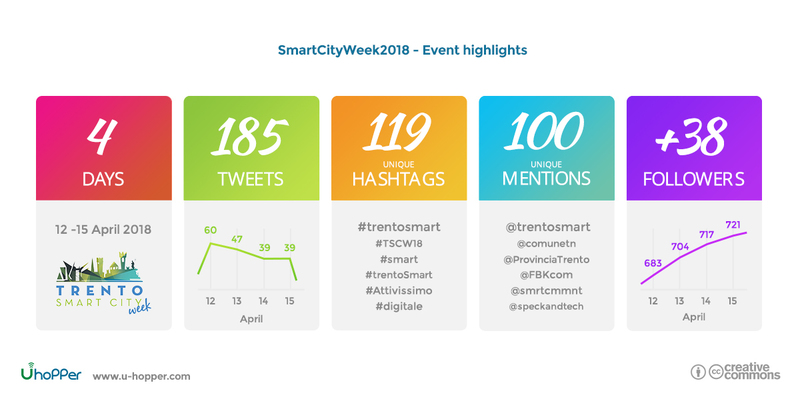 Monitor the official Twitter account of Trento Smart City Week 2018 @trentosmart: this is what we have done during the four days of the event. Our objective has been collecting and presenting relevant information regarding the social coverage of the event. The choice of this kermesse has not been random: also the operational headquarters of our company is, in fact, based in Trento. Tapoi, our platform for social analysis and profiling, has been used for the monitoring process. Such analysis are suitable for multiple cases: while reading this article try to imagine how the same information extracted could be used for studying the social presence of a competitor of for identifying a group of influencers for running a brand campaign. Our analysis focused on the contents shared on Twitter and allowed us to classify them in the various themes (or categories) covered during the event. In particular, we considered two models: the general and the dedicated ones. The general model is made up by 18 general purpose categories including the Technology, Sport and Politics ones. The dedicated model focuses more specifically on those themes that were the focus of the event. identification of those word and topics more relevant for the analyzed contexts. 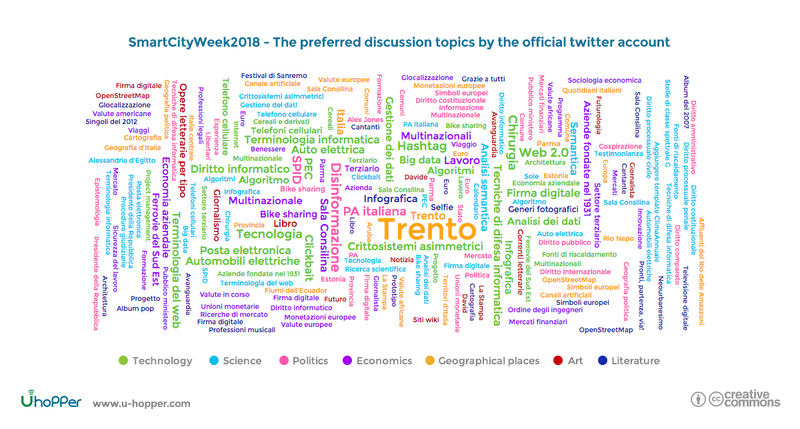 The spider chart allows to compare the content of the social activities shared directly by the Twitter account of the @trentosmart account with those activities that more generally mentioned it. In both cases, Technology appears to be the preferred topic of discussion and it is closely followed by Politics and Economics. 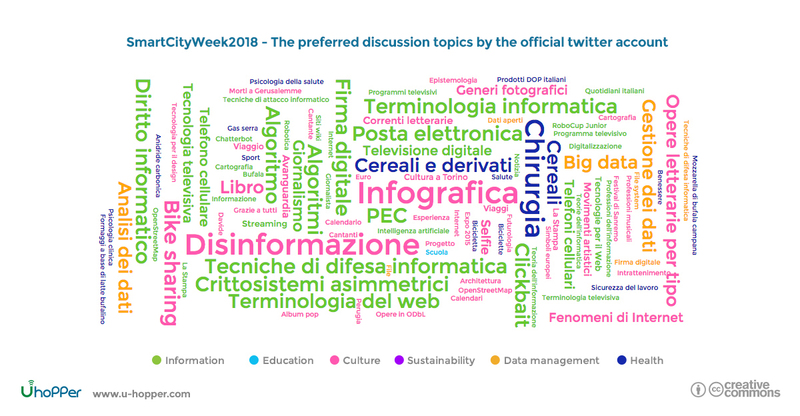 The information described in the previous spider chart is confirmed by the word cloud collecting the preferred words and topics used during the social conversation: Technology words are clearly stand out. Digital Rights, Techniques of computer security, Electric cars, Bike sharing, Big Data and Data management are among the preferred words used. Definitely more intriguing are the results coming from the dedicated model analysis. 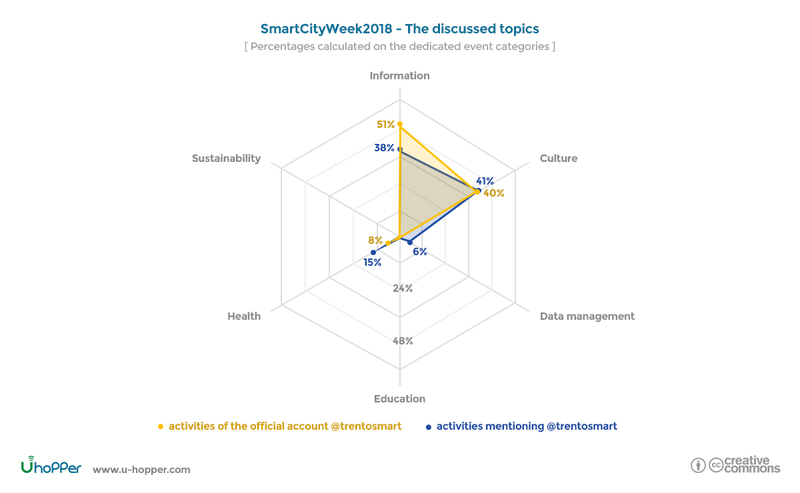 It is clear that the Information and Culture themes received the most coverage when compared to the other official topics of the Smart City Week event. In this case, the discussion of the official event account was definitely aligned to the general one although the latter focused also on the Health and Data management. Among the more relevant words used Disinformation, Algorithms, Digital signature, Big data and Data analysis definitely stand out. 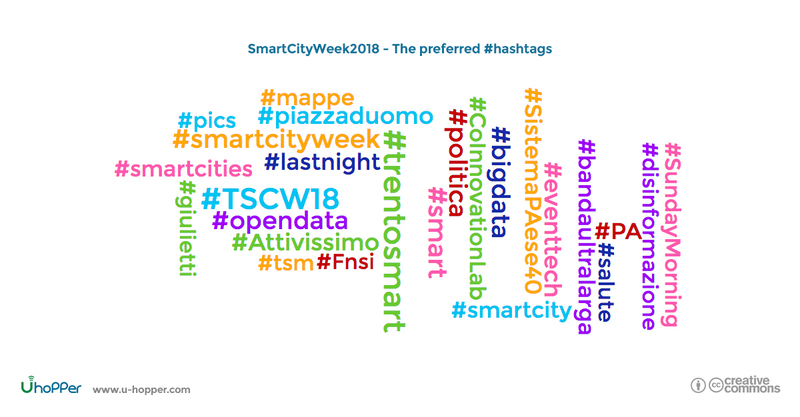 The official event hashtags – #trentosmart and #TSCW18 – are obviously present among most used ones together with #opendata, #Attivissimo, #bigData and #smartcity. 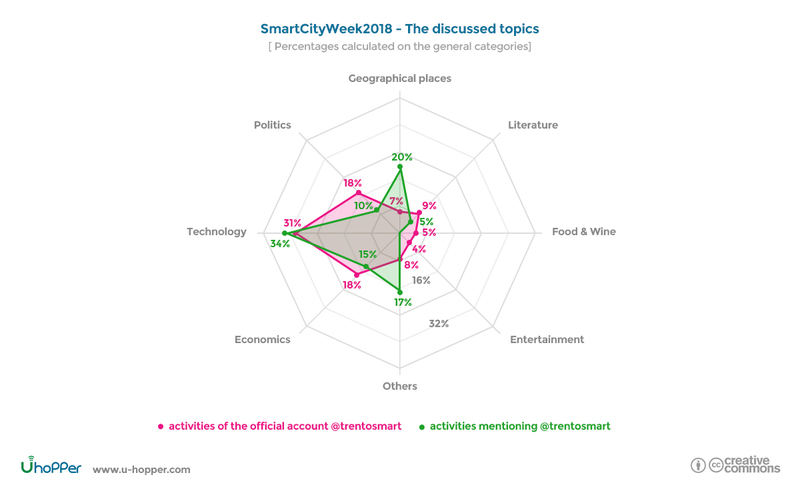 By monitoring and analyzing the social coverage of the Trento Smart City Week 2018 we were successfully able to identify and confirm the main discussion topics of the event. Curious to see the analysis results of other events? Check out what we discovered during the Trento Economics Festival 2017. This project has received funding from the European Union’s Horizon 2020 research and innovation programme under grant agreement No 739783 (DataSci4Tapoi). The information and views set out in this article are those of the author(s) and do not necessarily reflect the official opinion of the European Union. Neither the European Union institutions and bodies nor any person acting on their behalf may be held responsible for the use which may be made of the information contained therein.